Home > Blow molding machine > HE750/S — Find us at K 2016! 09 Sep HE750/S — Find us at K 2016! 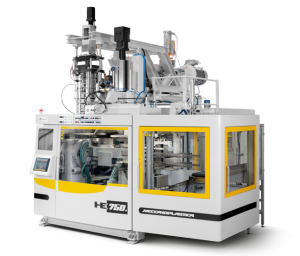 This year at K Fair, Meccanoplastica will feature our continuous all electric Extrusion Blow Moulding machine, HE750/S. According to their design, the HE systems are not only very quiet, but the extrusion blow Moulding machines of the full-electric HE series ensure extremely high-performance levels to ensure fast and accurate movements. They allow for lower production consumption and are suitable for the production of containers of up to 20 litres in volume. During K fair, this machine will run equipped with a “W.MULLER” SINGLE parison extrusion head and 1 cavity Mould to produce a PE Jerry Can 20 Litre medium molecular weight. Expected output/hour is approximately 80-85 pcs/hour. Be sure to visit Meccanoplastica at K fair in Dusseldorf, which will be held from 19-26 October. Stop by our Stand B18 – Hall 14 to get a look to our LATEST HI-TECH full electric machines! Contact us – EBM Machine, SBM Machine and IBM Machine now for more info.